I have a confession. I have never read a Judy Blume novel. As a woman who does girlhood studies, it feels embarrassing–like saying “I’ve never read Hamlet.” But, there it is. My BFF, Emily (who is getting married next weekend (!!!)) was an avid Judy Blume fan so, in my head, I can hear her scolding me. Or was it Beverly Cleary? See. This is the problem. In my young mind, Judy Blume mixed in with other books I should have been reading and wasn’t. How could this happen? Well, aside from reading every Caroline B. Cooney book I could get my hands on and Harry Potter, I wasn’t much into young adult literature when I was a young adult. I was kind of a snob. I was very serious. In elementary school, I played a game called pick the biggest book I could find at the school library and read it. (It was Robin Hood and my best friend Amanda and I laughed over the frequent use of the word bosom and called ourselves bosom buddies.) In high school, I read Shakespeare’s complete plays, all of John Steinbeck’s novels, lots of Russian literature, Sylvia Plath, and Harry Potter. I looked down my nose at my friends who read romance novels in which the young protagonists always died of some sad, terminal disease. Now, although I don’t primarily study children’s/young adult literature, my lack of knowledge about Judy Blume weighs on me. I feel guilty about it. This morning, I read a wonderful article about Judy Blume’s legacy in The Guardian and I decided to follow through on something I planned to do last summer. I am finally going to read some Judy Blume, dammit. So, dear readers and friends, where do I start? 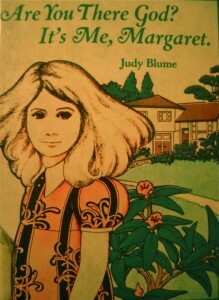 What is your favorite Judy Blume novel? Is there a particular book that would be good to read with a certain girl of 10 who is on the cusp of puberty? I’ve checked out Summer Sisters and Starring Sally J. Freedman as Herself as a start, but I’d love to know your thoughts and memories about Judy Blume’s writing. Emily and me as the wicked step-sisters, back in my book snob days. Um, me, too. But it’s one of those things I’ve been meaning to do since I have a little girl who’s only gonna get bigger.